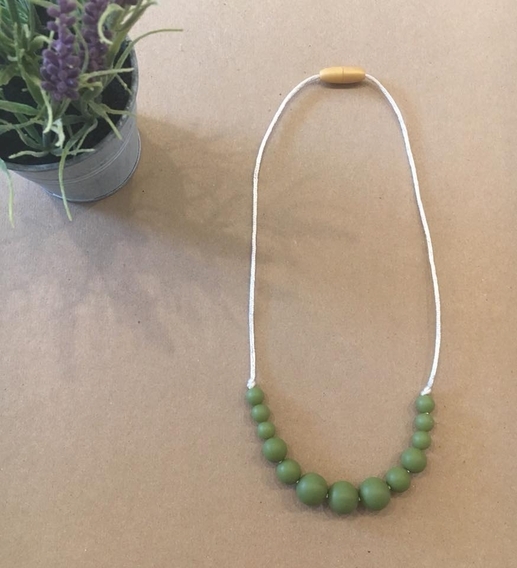 Silicone Teething Necklaces are a great alternative for kids that need to chew on something, fidget during class, have autism or are on the spectrum, or just need a security measure. Each necklace is lovingly handmade and features food-grade silicone. The silicone is bpa, lead, and phthalate free. It also has no odor. This is a CHILD SIZE necklace and can be worn by kids ages 3+. These necklaces are great for kids that need to chew on something later in life. PLEASE SUPERVISE YOUR CHILD THE ENTIRE TIME THESE ARE WORN. Each necklace is features a pop clasp that can be popped open but is not necessary to do so to put on. Each necklace drops approximately 10" for a total length of 20". All handmade here in the USA.